We Finally Tried Geek Fuel, And It's Our New Favorite Thing | Nerd Much? There’s a monthly subscription box for everything, isn’t there? There’s LootCrate, My Geek Box, Bark Box, Plated, Candy Club, BoxWalla, Graze, and so many more that we would need an abacus to keep track of how many there actually are. When you think about it, it’s a pretty cool concept, and there’s likely a sub box program out there somewhere that speaks to even the skeptics. 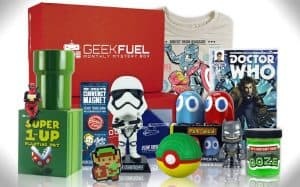 We’ve tried many of the pop culture box subscriptions, and while some are great (LootCrate gets our nod), others have proven to not be worth the money (we’re not big fans of My Geek Box, for example). But after receiving our first Geek Fuel box, we’re quite impressed, and hopefully the quality of our first box continues with the awesomeness month to month. That will, of course, take some time to figure out, but we’re super impressed with what just came in the mail. This is the first time that a sub box has presented a 100% hit rate with things that are relevant to me. Typically speaking, you’ll get two or three cool things each month, with the rest being scrap, presenting a low hit rate (or things that “hit” specifically with your likes). I don’t know if Geek Fuel could possibly keep that hit rate up every month, but the fact that the first one was so high is a good sign. The company claims that each box will have a $50 minimum value, and we’d estimate the value of our first box to be around $65. The Futurama T-shirt is not only a Geek Fuel exclusive, but it’s also super high quality (and not one of those thin, oddly-fitting shirts you might find elsewhere). And of course, given the fact that I drink three cups of coffee daily, having extra mugs on-hand is never a bad idea (especially when they’re superhero-themed). So why post about it to our readers? Well, you may have noticed that we have a category called “Cool Stuff” on this site, which features super cool nerdy things we think our readers will love. A lot of the stuff we feature in that category — cool superhero socks, mugs, and nerd fashion, for example — can be found in the box…every month. 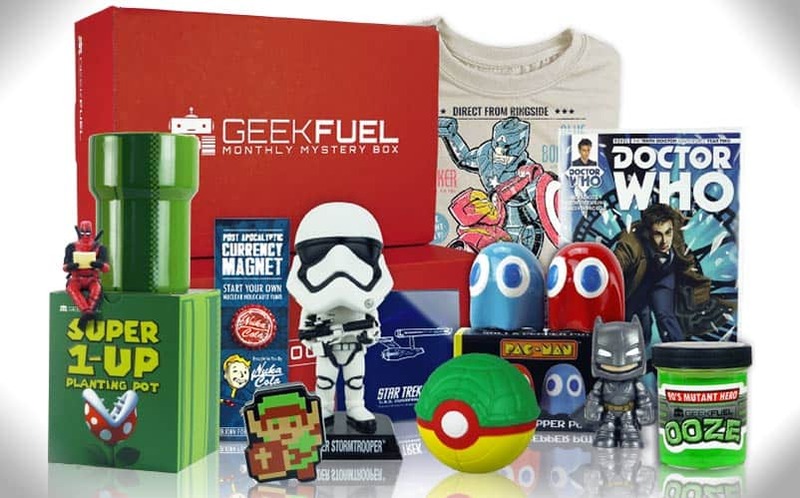 As far as the many nerdy subscription boxes are concerned, Geek Fuel is a top-tier option. We’ll post back next month after we receive our second Geek Fuel box to see if the quality holds up, but the $13.90/month price is worth it (at least in our first month). For now, we recommend giving it a try, or possibly signing up a loved one for Christmas this year. For more info, check out the official site.